Real Estate Law is a primary concentration area of the Law Offices of Ralph J. Schumann. The firm handles residential and commercial transactions of all types, short sales, foreclosure defense, as well as loan modifications and loan workouts for clients. Schumann is Past President of the Illinois Real Estate Lawyers Association (IRELA), and Past Chair of the Illinois State Bar Association (ISBA) Real Estate Law Section Council. He has also been selected by his Peers to be a Member of the LEADING LAWYERS NETWORK in the area of Real Estate Law: Residential. 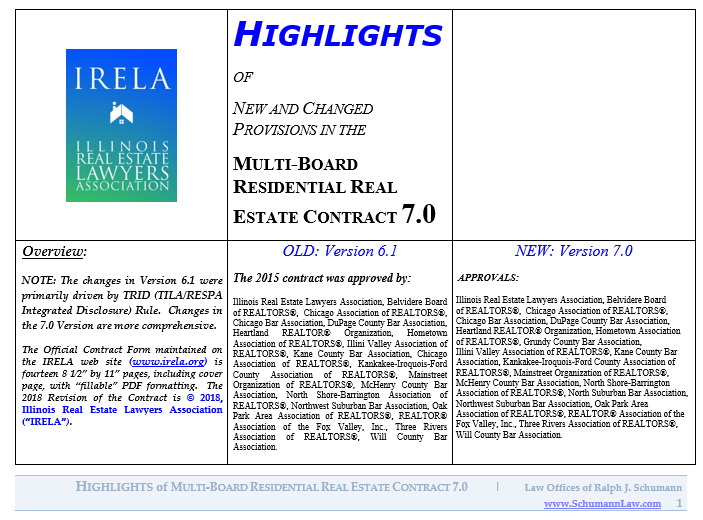 Schumann also serves as a Member of the Multi-Board Residential Real Estate Contract ("Common Contract") Task Force as the IRELA Representative, and is a Title Examiner with Attorneys' Title Guaranty Fund. He has authored multiple chapters in legal treatises regarding real estate law and is a frequent speaker at seminars regarding real estate issues. To access a brief bio on Ralph J. Schumann and the firm's real estate practice. A great deal of confusion exists regarding the various methods of holding title and the best mechanism to accomplish goals regarding property ownership. Ralph Schumann has authored a chapter for IICLE's Residential Real Estate on Forms of Holding Title, and recently participated in the taping of a television program for the ISBA's "Illinois Law" program series on the same topic. Residential property need not be held by a married couple, for example, as joint tenants. While one of the best methods of avoiding the cost and delay of probate is to hold title to residential real estate in a revocable living trust, more protection against creditors can at least be had under Illinois law by holding title as Tenants by the Entirety. Download an updated Primer on Tenancy By The Entirety. Schumann recently spoke at a NIU Law Review Symposium on The Mortgage Foreclosure Crisis with a panel of national speakers on the topic of "Foreclosure Defense and Alternatives: Litigation Steps, Practice Suggestions and Recent Developments." Download a copy of the handout from the seminar: NIU Schumann Handout - Foreclosure Defense and Alternatives, including Short Sales. Schumann recently spoke at a seminar sponsored by the Illinois Institute for Continuing Legal Education (IICLE) on Mortgage and Financial Outlook: Foreclosure Defense and Short Sales. Download a copy of the handout from the seminar: IICLE Schumann Handout. Schumann also recently spoke at a seminar sponsored by the Illinois State Bar Association (ISBA) on New Regulations and RESPA Changes. Download a copy of the handout from the seminar: Schumann New Regulations Changes Handout. Download and access a Memo discussing the pros and cons of making Counter-proposals in a real estate transaction: Counter-Offer Memorandum.